The historic town of Ashbourne is the southern gateway to the Peak. One of Derbyshire’s finest old market towns, it combines a medieval street pattern and historic buildings with a wealth of high quality shops. 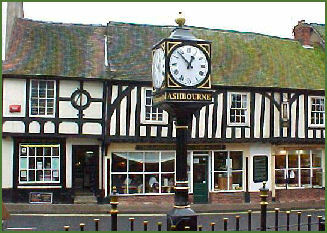 Dating back to Saxon times, Ashbourne is mentioned in the Domesday Book of 1086, where it is referred to as `Esseburne'. The name derives from the Anglo-Saxon 'aesc' (the ash trees) plus 'burna' a stream or brook, the stream where the ash trees grew. The town was granted a charter for a market by King Henry III in 1257. Church Street boasts many fine historic buildings, including the parish church of St Oswald's, Queen Elizabeth's Grammar School, (pictured below right) was founded in 1585 by Sir Thomas Cockayne, whose family`s coat of arms formed the school badge. 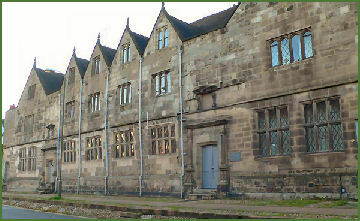 Owfield's Almshouses were built around 1640 with an upper storey added in 1840, Peggies Almshouses were constructed from local sandstone in 1669. The Clergy Widows Almshouse, a Georgian, 3 storeyed building, around the 3 sides of a courtyard, was built in 1733 for `the entertaining of widows of four clergymen of the church of England` and The Mansion, which was the home of the Rev John Taylor, friend of the lexicographer, Samuel Johnson, from 1740 to 1787. Black's Head is a Georgian coaching inn once visited by Dr Johnson and Boswell. A plaque on the front of a small terraced house in Sturston Street, marks the birthplace of Catherine Booth, wife of the founder member of the Salvation Army, William Booth. A memorial also stands to her in the memorial gardens near the playing fields. The Shrovetide football game is played annually over 2 days, on Shrove Tuesday and Ash Wednesday in Ashbourne. The cork filled leather ball is thrown by visiting personalities with the Up'ards and the Down'ards battling it out across through the streets and across open country. The town has been visited by King Charles I, Izaak Walton, Thomas Moore, George Eliot and Bonnie Prince Charlie, who stayed here on his march south to Derby during the ill fated 1745 Jacobite rebellion. The quaint triangular cobbled marketplace hosts a traditional outdoor market every Thursday and Saturday throughout the year. The Tissington Trail, a popular long distance footpath, starts at Mappleton Lane on the northern outskirts of Ashbourne. 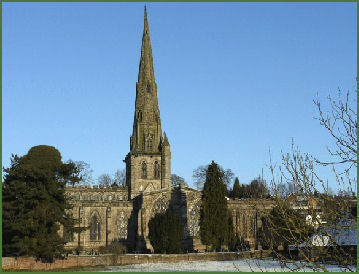 The gothic style St Oswald's Church dominates the town, its elegant spire, referred to by George Eliot as the "finest single spire in England" rises to 212 feet. St Oswald, King of Northumbra (635-642) was a popular Anglo-Saxon saint, who brought St Aiden from Iona to Lindisfarne and was later killed in battle. A church has occupied the site since Saxon times and the church has a Norman crypt. The present building was started in 1240 by Hugh de Pateshull, Bishop of Coventry and Lichfield. A very early brass plate commemorates the dedication of the church on 24th April 1241. Construction probably lasted until the early fourteenth century. The superb perpendicular east window, a gift from the Kniverton family. dates from 1385. The thirteenth century medallions in the northwest Lancet are the oldest glass in the building. There are many fine stained glass windows in the church, one of the best being one by Kempe which depicts the coats of arms of Normandy and England. Each of the buildings transepts houses a chapel dedicated to leading local families. In the north transept, the Cockaynes, and the Boothbys The south transept houses the Bradbourne's chapel. 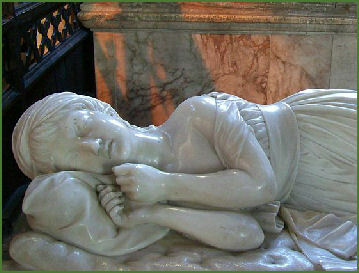 The monument to Penelope Boothby, daughter of Sir Brooke Boothby, 6th Baronet is an exquisite and highly realistic sculpture made from Carrara marble in the form of a sleeping child is the work of Thomas Banks. The oldest monuments are those of John Cockayne dating to 1372 and of Edmund Cokayne which dates to 1403. The pulpit dates from 1882. Its base is of Derbyshire gritstone, while the panels are of alabaster and are believed to have come from the old tombs of the Bradbourne family. The church was restored by Gilbert Scott in 1837-40. The Burrows Garden is situated 5 miles to the south east of Ashbourne. Set in beautiful countryside, the superb gardens cover 5 acres. Dovedale, a dramatic limestone ravine, with its impressive rock outcrops and tranquil woodlands is arguably the prettiest of the dales in the Peak District National Park and is owned by the National Trust. Biddulph Grange, one of Britain's most exciting and unusual gardens, was created by the horticulturalist James Bateman (1811–1897), for his large collection of plants from around the world. Haddon Hall near Bakewell, is an architectural gem. Dating back to the eleventh century, the hall has been described as "the most complete and most interesting house of [its] period", it is the finest example of a medieval manor house currently in existence in England.